We had a lot of special moments on this trip and I appreciated the thoughtfulness of Margeaux’s response. And I wondered if she might have been thinking about Michael or Lucy? The third morning Michael came down to the kitchen early and asked whether he could help. I was alone for a moment and had just filled the griddle with eight pancakes. “Would you please spoon a few blueberries into the middle of each pancake before I flip them?” And then I showed him how to do it on the first couple of pancakes. He carefully spooned blueberries onto the next 40 pancakes and quietly beamed. 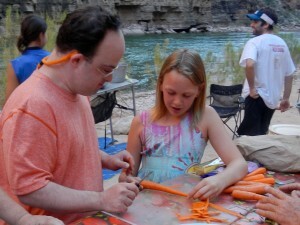 Lucy said, “OK!” as though she had coached carrot-peeling twenty times before. I paused long enough between tasks to marvel at her patience, how often she validated Michael, and how non-patronizing she was. In a word, she was very loving. I was moved and I told her Mom what a special kid she is. The next night was the final night of the trip and I had baked what we call a “giant cookie.” Three boxes of chocolate cookie mix filling the bottom of a single 16” Dutch oven. It was hands down the most popular dessert of the trip. As darkness drew near there were just two squares of giant cookie left on the cutting board. Michael and Jake, Lucy’s older brother, surrounded the remains and were moving in quickly to gobble up the last of the cookie. To my surprise, they both liked the idea, and off they went. Jake presented a cookie square to his Mom, and told her, “Thanks, Mom.” I lost track of Michael for a moment, and then I saw him circling around a large group of people looking for someone in particular until he found … Lucy. And he presented her with the last of the giant cookie with a smile on his face as big as the Grand Canyon. I couldn’t hear their words, but the look on Lucy’s face was … was, rather like her best-buddy boyfriend had just pinned a corsage on her dress at the junior prom. I don’t know whether Lucy teared up, but I sure did. And I thought back to an AzRA training exercise on the San Juan River many springs ago. Twenty guides had just shared stories about interactions with guests over the years and we were looking for the common thread that would answer the question, “What is it to be a guide?” When we started the exercise, we didn’t know what the answer would be. After two hours of sharing stories—just like the story of Michael and Lucy—it took us only a few moments to uncover the answer. The common thread is love. don’t know if you have already seen this. 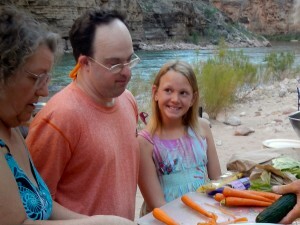 This was published by our trip leader on the companies web site about our grandcanyon raft trip we did in the summer of 2012.